I had an aha! moment when I was a guest on CNN. The host asked me what my ratio was and I automatically said: three to one. A ratio, when it comes to packing, is the number of tops you pack per every bottom; I pack three tops to every bottom. For most trips, I pack about nine tops and three bottoms (plus shoes… but that’s another story). 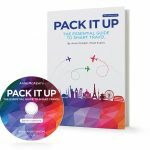 This ratio will vary from person to person, and even from trip to trip, depending on your personal style, reason for traveling, and your access to laundry. Packing three tops to every bottom allows me to pack a wide variety of outfits using only a few, versatile pieces. By planning a wardrobe around a central, neutral color everything can mix and match. (This way I’m not aren’t forced to wear that one shirt only with that one skirt.) 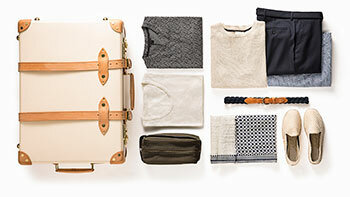 Multi-use items can extend a travel wardrobe even further. I’ve found it’s easier to start with the bottom pieces and then figure out which tops work best. The bottoms depend on the weather and destination: For warm weather it’s usually a pair of capri’s and/or shorts, a skirt and a sundress; for cold weather it’s usually denim jeans, a nice pair of pants and maybe a warm dress. By wearing neutral colors on the bottom (like black, tan & denim) they tend to show less dirt (than white!) which means less laundry. The best thing about wearing neutral colors on the bottom (tan, black & dark denim) is that any color top matches. That takes out half the stress of planning what to pack! Have fun with your tops (remember: it’s nice to have photos that don’t always show you in the same shirt) and don’t forget to take a sweater – a/c happens. I like to pack a variety of shirts: tanks, short sleeves, ¾ sleeves and long sleeves so I can layer for changing weather. A scarf is the perfect way to add variety to your travel wardrobe without adding weight to your bag. Get two completely different looks from the same black shirt and pants by adding a scarf or a piece of jewelry. Tip: I like to purchase jewelry on my trips from local artisans. It’s fun to meet the designers in the market places, really fun to wear on my adventure, lightweight to pack home and is the perfect souvenir! And most importantly, I feel good about supporting the local economy.